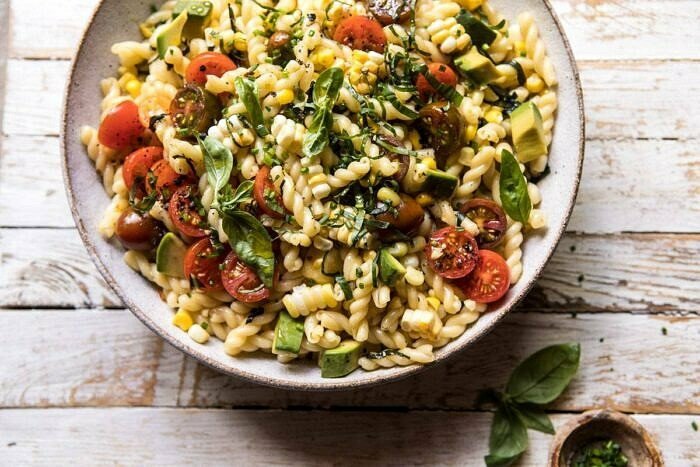 Corn, Tomato, and Avocado Pasta Salad. If you’re going to eat a salad today, it should probably be this salad. It’s the perfect quick fix salad that’s almost no cook and comes together in minutes. 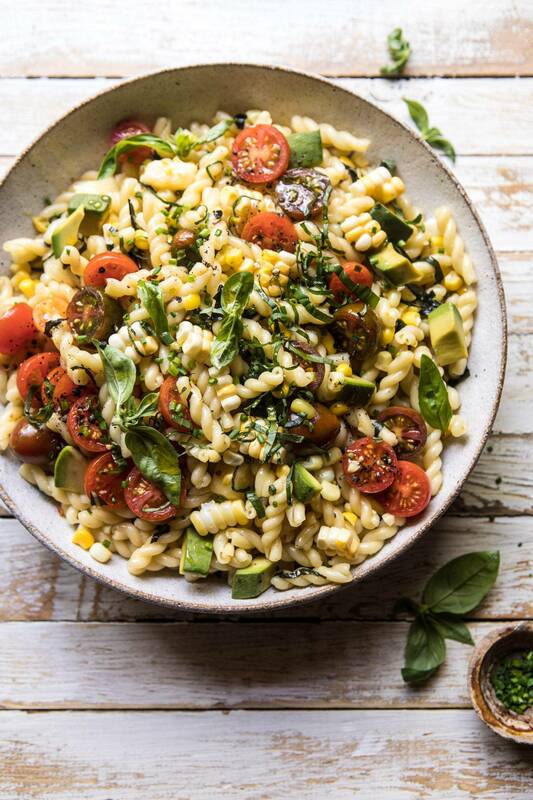 Grab your favorite pasta, fresh cherry tomatoes, sweet corn, basil, cheddar cheese, and an avocado…toss it all together, and done. It’s summery, healthy, and so good! The saying around the Gerard household is that simple is the best, and the more recipes I create, the more I really realize this. Sure, I also love a recipe that takes more time to make, and you know I love spending time baking up my favorite layer cakes, but when it comes to everyday cooking, I’m all about simple. I spent some time talking to my aunt and uncle this past weekend and they were telling me how they love good food…but simple food. High quality ingredients that just taste really good. As I was talking to them something kind of clicked in my head and it made me realize that as long as you have really good ingredients, you can make a simple, delicious recipe. A recipe doesn’t have to have a whole bunch of ingredients or be hard to make. It just needs fresh quality ingredients. That’s kind of this salad. It’s probably one of the simpler recipes I have on HBH, and quite honestly, I should probably be saving it for Super Simple Thursday, but this pasta salad just felt like a fun way to kick the week off. Like I said above, if you’re going to eat salad today, why not make it of the pasta filled kind, you know? With August here, the summer produce is at its peak. This makes cooking with fresh ingredients easier than any other time of year. 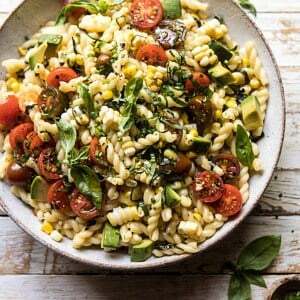 Enter in this fresh corn, tomato, and avocado salad. It’s summer in a bowl. 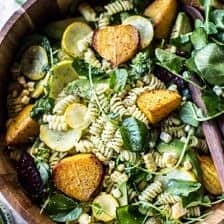 It’s also so delicious, pretty healthy (try using brown rice or lentil pasta to make it even healthier), and highlights all of summer’s best in season produce. To start, find your favorite short cut pasta. I used an organic variety from Costco that I love using for pasta salads, but use your personal favorite. To give this salad even more of a health boost, use brown rice pasta, whole grain, or even a lentil pasta. All would be really great in this salad! As mentioned, this is a QUICK and almost no cook recipe. While the pasta is boiling (the only cooking you will do), prep all the remaining ingredients. For the fresh corn, you have a few options. I personally like to leave the corn raw and toss it up with the hot pasta. The heat from the pasta will warm the corn, but still leaves it with a nice bite, which I love. 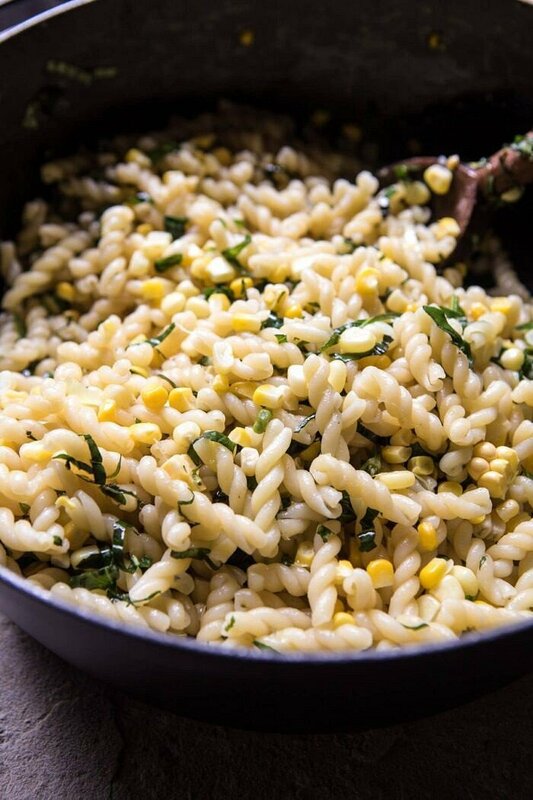 If you’re not a fan of raw corn, you can used grilled corn or toss the corn in with the boiling pasta water for a few minutes until it is cooked. The rest of the salad is a mix of cherry tomatoes, herbs, avocado, and cheddar cheese. Good summer flavors. Here’s the key to this pasta. As soon as you drain the pasta, toss it with the herbs and cheddar cheese while the pasta is still steaming. Hot pasta equals melty cheese, which equals extra delicious pasta. Trust me on this. I know this may not be the usual way to make a pasta salad, but guys, it’s good! Once you’ve tossed the pasta, add the remaining ingredients and serve. You can eat this warm or at room temperature, but me being the hot food lover that I am, I like this best while it is still a little warm. Also, this is great recipe for back to school lunches or bring to work lunches. The pasta holds up really well in the fridge and would be great to make on a Sunday for the week ahead. Just add the avocado the day of, so that it doesn’t get brown. It’s kind of as quick and easy as that. What I love most about this pasta recipe is that it really does use some of summer’s best ingredients. 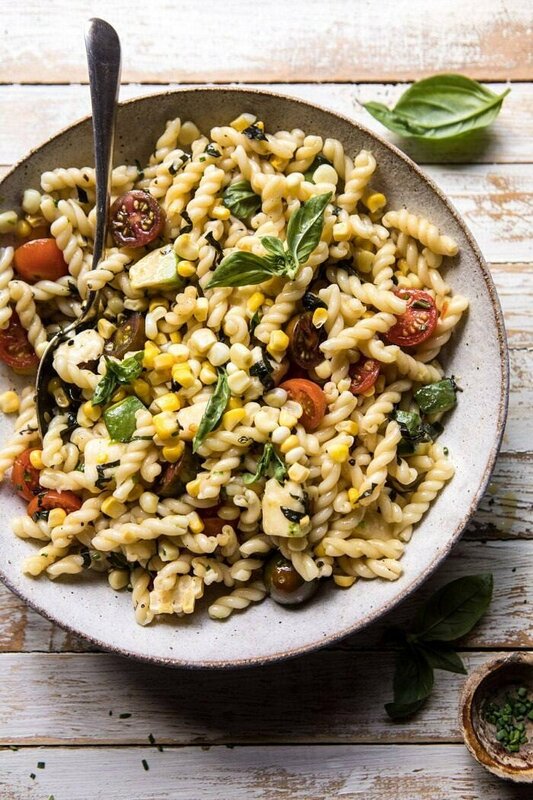 So if you have a surplus of fresh corn, cherry tomatoes, and basil lying around, this is the recipe to make. OH, and I have to mention, if you have any other herbs on hand besides the basil, say thyme and or oregano, throw them in too, they would be awesome in this. Use what you have or what you love! It’s always important to adapt recipes to your taste! 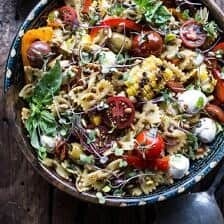 If you make this corn, tomato, and avocado pasta salad, please be sure to leave a comment and/or give this recipe a rating! I love hearing from you guys and always do my best to respond to each and every one of you. Oh, and of course, if you do make this pasta, don’t forget to also tag me on Instagram so I can see! Looking through the photos of recipes you all have made is my favorite! The perfect quick fix salad that's almost no cook and comes together in minutes. Grab your favorite pasta, fresh cherry tomatoes, sweet corn, basil, cheddar cheese, and an avocado...toss it all together, and done...summery, healthy, and so good! 1. Bring a large pot of salted water to a boil. Boil the pasta to al dente, according to package directions. Drain. 2. Meanwhile, add the basil, olive oil, cheddar, parmesan, lemon juice, chives, and a pinch each of crushed red pepper flakes, salt, and pepper to a large serving bowl. Add the hot pasta and toss vigorously to combine. 3. Add the corn, and tomatoes, tossing to combine. 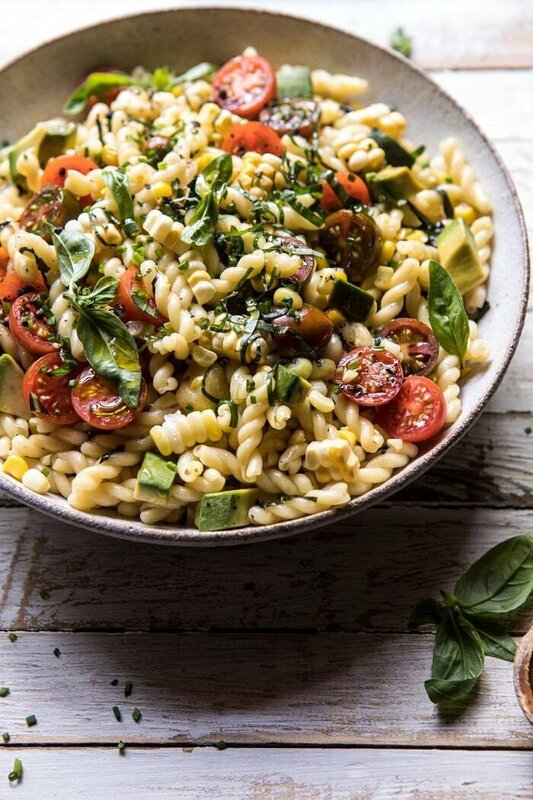 Top the pasta with avocado. Season with freshly cracked pepper and salt. What kind of pasta is shown in the picture? Looks good but I personnaly think it’s a shame you waste a post on this kind of recipe. Anyone who cooks a minima can throw this kind of salad together, no? Like your tomato & cheese toast last week, nothing really new… Simple can sure be the best but no one needs mile-long recipes to do that. It sure must be difficult to suggest something new every day, how about posting less (3-4 times a week?) but staying creative with original recipes? Love your blog but my friends & I have the feeling you’re sometimes getting bored with cooking or you’re too busy with your many projects. I am a reader that loves your simple recipes, even more than the complicated ones. I live in a tiny apartment in a major city and have zero space (or inclination) to make anything more complicated than this. Thanks for creating posts for all types of readers, Tieghan! And this look DELICIOUS. Thank you so much Caitlyn! I am so glad you love the simple recipes on my blog! I love to give you guys a variety of recipes! I hope you continue to love my blog! Fun recipe. Will probably make as a side with steak (cut in half, of course). Yes simple, creative, complex. A mix is great. Sometimes I like to spend all day in kitchen; other days I don’t. It’s too bad people have to post unkind comments. If the post isn’t for you, just move on, please. Tieghan, I want to thank you for all your great recipes. Even though I’ve been cooking for many years, and people say I cook gourmet, I can run out of ideas or get stuck in a rut. Actually, your tomato toast recipe last week, saved the day for me. We’ve been spending countless hours going back and forth to the hospital to be with a sick friend. The emotional exhaustion left me feeling like I couldn’t make a thing for supper, but you inspired me. I made a garden salad and the tomato toast and we had a nice, refreshing and nutritious summer meal, that beat take-out! Also, with your recipe today, you shared a great tip about adding the cheese while the pasta is still warm. Now, eager to try this.. You work so hard and give very generously of your time and talents. I’m sure many of your readers really appreciate it, even if we don’t always comment. Blessings. Hi Carolynn! This is so sweet and I am so glad you shared your thoughts with me. I am glad you find some inspiration in my recipes and sometimes you just need a quick and simple recipe! Also, I hope your friend is doing better and wish him or her the best! Looks like the perfect recipe to use up my garden basil and the plethora of cherry tomatoes that are coming in! 🙂 And for what it’s worth, while I love baking and spending extra time in the kitchen on weekends, I love having simple week-night recipes. They are practical for many people too with busy schedules and who work away from home and commute! Thank you so much Brittany! I am so glad you like this recipe and hope you try it! This was delicious. We had it tonight wicedsr planked salmon. Thanks Tieghan. Obviously Aiden’s mother never taught him, if you don’t have anything nice to say, don’t complain about people giving you free recipes that actually take a lot of time and money to deliver. You are doing an amazing job– don’t let anyone make you feel bad about whatever you decide to serve up. Thank you Norma! I hope you love this recipe and other recipes on my blog! Just a quick word of encouragement – I rarely comment but I read your blog religiously, every day for at least a year, probably closer to two. Post whatever you want! Your recipes are beautiful, accessible, and delicious. Every time. Thank you so much Ashlee! I am so glad you think this way and have been enjoying my recipes! 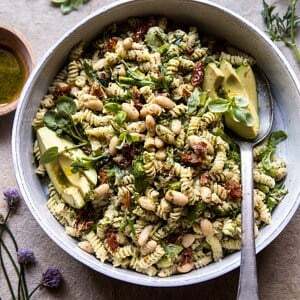 This pasta salad looks like exactly what we need in our weekly line up ! My boyfriend and I are ALL ABOUT seasonal ingredients used in simple ways sometimes I love to get down in the kitchen but more often, I need recipes like this in my repertoire when I want something delicious but quick and simple. And this in particular seems like a welcome departure from the tabbuleh we’ve been making for the past 3 weeks (sooo good and so fresh). Thank you ! Summer produce is where it’s at, I’ll miss it. PS – Making your peach and burrata pizza tomorrow ! I hope you LOVE the peach and burrata pizza Megan! Thank you so much! Also Summer produce is the BEST, I will miss it as well! 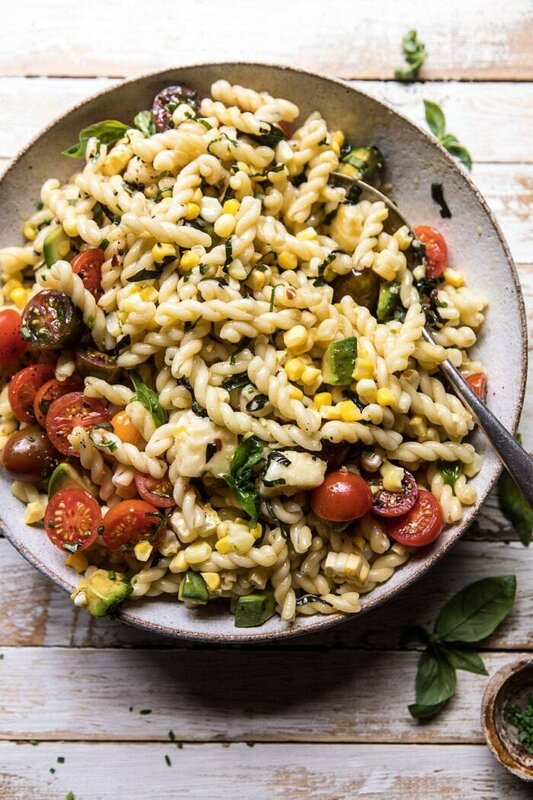 Simple summer cooking is my favorite and this pasta salad is so perfect for these hot August days! I love your recipes and just searched your blog last week for a pasta salad to make for a barbecue we went to. I wanted something simple but elevated like all your recipes. Can’t wait to try this. I hope you love this Krystle! Thank you! I tried hitting ‘reply’ to respond to your earlier message, but for some reason, it didn’t work. Thank you for your very kind and thoughtful response. I appreciate your concern. We made this pasta salad for supper tonight and it was delish! We used marinated artichoke hearts rather than corn and added some grilled chicken breasts we had on hand to make it a little more filling. We enjoyed a very tasty supper with a glass of rosé. Perfect for a very hot summer day. Thanks! I am so glad you loved this Carolynn! Thank you so much! This was delicious, but the leftovers got a bit dry. Is there any way I can rehydrate it a bit? I am so glad you loved this Eliza! Thank you so much! I hope you love it! Thank you Connie! I just wanted to say that this recipe is so incredible and easy!! While working weird hours on a daily basis, it is really nice to come home and try a new recipe without it taking more than 45 mins to make. Tieghan you are amazing and keep making these fantastic recipes for us please!!! Thank you so much Mary Kate! I am so glad you loved this recipe and hope you continue to love them!! This pasta salad is one of the best things I’ve made in a long time, and I cook a lot! It was warm, perfect, flavorful, and a texture sensation. Perfection. Thank you Tiegen, you have a real gift for recipe development for healthy simple everyday food. Thank you so much Shari! I am so glad you loved this recipe and it turned out amazing for you! My husband and I made this tonight for dinner. Great, easy, fresh weekend meal. We will definitely make again. Thank you for sharing!! I am so happy to hear that! Thank you so much Rebecca! YUM. My only issue with this recipe is that I can’t stop eating it! I used pepper jack cheese since I had it on hand, this was incredible. The avocado made the best sauce with the olive oil and the cheeses. And it was so easy!! Haha that is so amazing! Thank you so much Libby! I am so glad you love this! I made this last and it was delicious! So fresh, seasonal, and easy to pull together on a week night. I have taken it to work for lunch along with half an avocado to mix in. I ate it warm for dinner but enjoyed it cold for lunch. The only change I made was to top with extra Parmesan because you can never have too much cheese 😂. I appreciate a recipe that’s both simple and delicious, so thank you! Thank you so much Josie! I am so glad you loved this recipe! 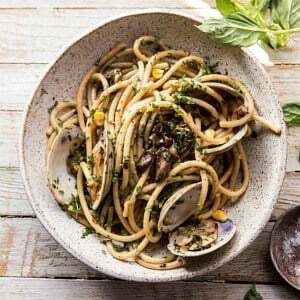 I have made this pasta twice already, it went over so well with my big family that they requested it again the very next day when someone was poking around the fridge for leftovers and there weren’t any. It was easy to make, and included simple ingredients that everyone likes but in a great flavor combination. We’re in New Jersey and we have great corn and tomatoes this time of year, and we have some basil growing in the backyard, so it felt like I was making such a fresh and local farm-to-table type of dinner. I will definitely make this again and again as it’s a great dish for a group. I followed the recipe exactly, although my photo wasn’t as beautiful. In general I love getting your email recipes and always look forward to trying some new things from HalfBakeHarvest as I’m not a great cook but everything I’ve made is always good. Thank you! I am so happy to hear that you and your family loved this recipe Erin! Also, love how you were able to use local ingredients! Thank you! I made this last night and it was so good!! I used feta instead of cheddar simply bc that’s what I had, but everyone gobbled this up! I was able to use some leftover grilled corn and added a few kalamata olives to my daughter and my dish. This will be going into my summer recipe collection! Simple and delicious! Thanks for the yummy recipes!! Thank you so much Amanda! I am so glad you loved this recipe! Great pasta salad! I added some romaine and it was a wonderful salad to take to a Backyard BBQ-themed dinner. Thanks for the recipe! I am so glad you loved this! Thank you Diane! I hope you had an amazing backyard BBQ themed dinner.. sounds so fun!! I made this last night and everyone loved it! The pictures looked so good I decided to double the recipe and now we have leftovers for lunch. I’ve been following you for a few years and always appreciate all of your creativity and recipes. It’s nice to have a recipe that I know I can throw together with ease and is a hit it my family. Thank you! Thank you so much Kara! I am so glad you loved this recipe! Very good! Was put of lemons so subbed red wine vinegar. I also grilled some zucchini and added it with the other veggies. Served with grilled chicken. Thank you so much Kara! I am so glad you enjoyed this recipe! Wow that is so amazing! Thank you Barb! Hi, This recipe is delicious. I made it for dinner last night and the flavors are great. I added grilled chicken to the recipe too. It’s perfect for the hot and humid days this summer. It came together in no time and can’t wait to make it again. I loved this ! thank you so much. keep your recipes coming ! I just wish I had more time to try all of them ! Thank you so much Kristine! I am so glad you loved this! This was so incredibly easy to make and so delicious!! It is the perfect summer side dish. This pasta will definitely be featured a lot at my home! I made this recipe and I was so impressed that such a simple recipe can taste this good! I didn’t have any cherry tomatoes and it still tastes great. I added chilly flakes and used Parmesan. Thanks for sharing! Hi Jenn! I am so glad you loved this recipe! Thank you so much! I really enjoy this, can it also be done in the southern hemisphere? Of course! I hope you love this Lugar! Thank you!